As customary for the series, the display of the Samsung Galaxy Note 4 is the highlight feature alongside the S Pen support. This is the first year when the diagonal remains unchanged at 5.7", but the resolution got a massive boost to QHD - 2560 x 1440 pixels. This means that despite its ample surface, the Super AMOLED panel offers a mind-blowing 515ppi - way above the 300ppi Retina threshold and easily better than any of its direct rivals. 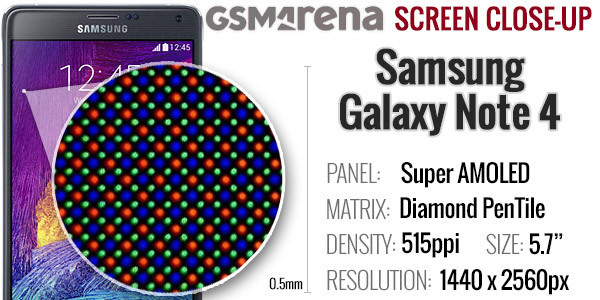 Samsung has again went for the diamond-shaped PenTile matrix, although given the sheer number of pixels their sub-pixel arrangement will hardly affect the perceivable sharpness of the screen. The default screen mode comes to underline the Super AMOLED panel's key strength, high contrast, by producing overly saturated colors that make every image look like it's going to pop out of the frame. Yet if you are a professional that requires absolutely accurate colors or simply aren't a fan of the slightly unrealistic images there's the professional photo mode, which turns the panel into a proper photographic tool - with colors as true as possible. The Samsung AMOLED panels have been improving at a great pace with each new generation and this latest effort is further proof of that. Giving you a choice between saturation and accuracy, and comfortably beating its rivals at either end is an impressive achievement, but with the inherent AMOLED strengths in the equation, you get arguably the most impressive screen in the market. But enough words, let's give you some more numbers. The Samsung Galaxy Note 4, as we said, has a practically unlimited contrast ratio, as it's capable of displaying black by simply turning off individual pixels - AMOLEDs light up only the parts of the screen that display a color different than black. The Super AMOLED panel on the Galaxy Note 4 isn't the brightest when compared to some LCDs, but it can go higher than its predecessor. Note that some users report that the Auto Brightness mode can push the brightness higher than the brightness slider would allow you to. We didn't observe this in our test lab. Under direct sunlight, the Galaxy Note 4 is able to retain excellent contrast and stay legible even in the most brightly lit environments. 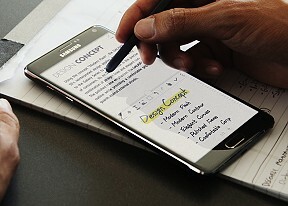 The Samsung Galaxy Note 4 comes with a redesigned S Pen, which is notably slimmer than the one inside the Galaxy Note 3, while retaining the same elliptical shape. The slimmer body would have made it a bit hard to handle, but Samsung has successfully offset this by adding fine ridges on its surface, improving the grip. The overall result is on par with the previous generation - the new S Pen has very similar handling, while the button on its side isn't much different either. This is to say it's not exactly the most comfortable button around - far from it - but it's about as good as can be expected given the size of the stylus. Along with the S Pen, Samsung has also replaced the Wacom digitizer on the Galaxy Note 4 itself, making it more sensitive. The new digitizer can recognize 2048 different pressure levels - double that of predecessor and, while you won't be able to actually make 2 thousand lines of different thickness, you definitely gain more control and handwriting feels even more natural now. The battery life was a bit of a question mark hanging over the Samsung Galaxy Note 4, considering the screen resolution has nearly doubled, with the battery capacity remaining almost unchanged. 3,220mAh sounds like a pretty ample battery, but we were curious how it compared to the stellar endurance of its predecessor. As it turns out, our worries were in vain as Samsung has done more than enough on the back-end to compensate for the new more powerful chipset and the higher-res screen. 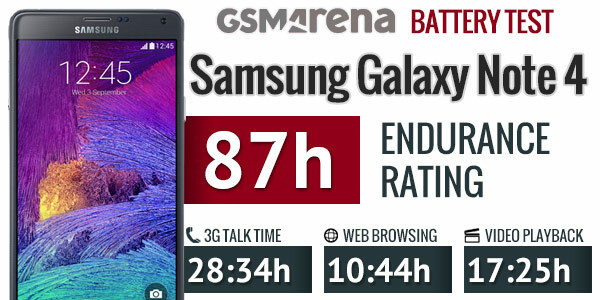 The new phablet managed to last longer than the Galaxy Note 3 by just over 10h, posting the overall great score of 87h. UPDATE: After Samsung updated the Galaxy Note 4 to Android 5.0.1 Lollipop we decided to run a new test and found that the phablet is a little more enduring on the new firmware. The differences are very subtle - the call test was exactly the same, the browsing test was a little better and finally the video test was superior by the most points. Add the great stand-by and we get 3 hours more on Lollipop. An important note is due here though - while the Galaxy Note 4 score is excellent, the competition has moved forward too, so its rating isn't as impressive as it would've been last season. Our proprietary score also includes a standby battery draw test, which is not featured in our battery test scorecard but is calculated in the total endurance rating. Learn how we test here. 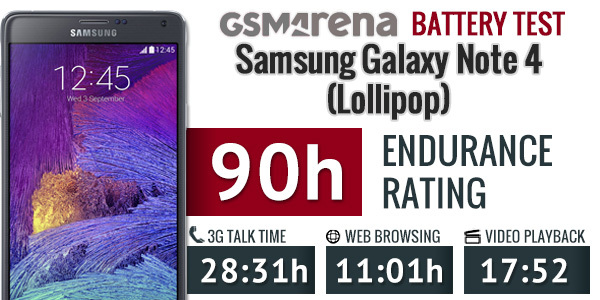 You can also see our detailed battery life post for the Samsung Galaxy Note 4 here.